We took these pictures yesterday in a park a few blocks away from our house, which delighted little Yorkie Rosie to no end. But I am wearing this outfit today as I run a few errands and work downtown, and Rosie is wearing her apple green collar to match Mummy. I know, I know – black over the knee boots are far too Wintery to wear in the middle of Spring. Unfortunately it’s still cold in Seattle and boots with socks are the only way to dress my cold sensitive feet. I do wear my light coloured boots more frequently at this time of year, but these particular black boots aren’t hibernating just yet. I rank them amongst my most comfortable footwear so it’s just as well that I can wear them for half the year. I’ve popped the boots over white clamdiggers to make them look more Spring appropriate (I would not wear these boots with white bottoms in Autumn and Winter). 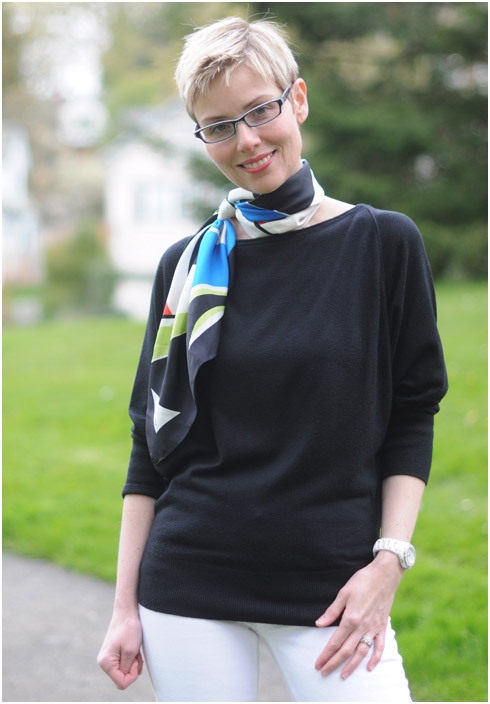 I added a simple black dolman sleeve pullover and colourful crisp silk scarf. Silky scarves, although they aren’t seasonal, feel especially Spring-like to me. The top part of this outfit is relaxed and retro and far less buttoned-up than if I’d worn a shirt with the jacket. The scarf has been tied like a man’s tie and pulled to the side so that one of the ends hangs down the front and the other down the back, just for fun. For extra warmth, I like my sharp shouldered boyfriend blazer with this ensemble. The grass green satchel is a Spring favourite, and my white watch and specs pick up the colour of the clamdiggers. I look like I’m about to jump onto my horse in this outfit. Well, I spent many years riding dressage and showing horses so it makes sense that Equestrian style is close to my heart. Update: These photos and a few outtakes are now in YLF’s Facebook photo album. Beautiful, if only I had your long legs..I think the same look on me would be dumpy, I’m only 5’4. Great look! I would never have put the black boots over the white pants (but then I am only 5’2). Like Angela I might steal the scarf idea. I have a funky retro scarf that I love but haven’t worn cos I just didn’t know what to do with it… now I know. Thanks. Angie, do you have any problem wearing dolman sleeves under a jacket? I always feel the sleeves would bunch up awkwardly. Yay, another equestrian look! I probably sound like a broken record by now, but I can only tell the truth, and the truth is that I simply love this outfit from head to toe. Absolutely perfect and I’d wear this in a heartbeat! It looks so comfortable, fun and very stylish. Also: such a clever idea to use white clamdiggers for this. And I love the slightly wider neckline of your sweater paired with this particular scarf knot. (How large is this scarf, if I may ask, Angie? I like it especially because the ends hang down quite a bit). Rosie is, of course, gorgeous as ever. I bet you two lasses attracted quite some attention in the park! Rosie really is smiling! Awwww …. Stealing this outfit today. Perfect for our “spring” weather. I hope my riding boots come up high enough to cover the bottom of my clams! Do you still ride, Angie? I LOVE this outfit! My dear sister-in-law gave me a beautiful Hermes scarf and I’m always looking for new ways to wear it and tie it, so I now have another. I’d love more info on how you tied yours. Can you provide more instructions, please? Aaa, Rosie is such a happy doggy Angie! Love the look. I would have never thought of pairing white bottoms with black OTK boots. Perfect for San Diego weather. Beautiful Angie. Love the color combination. You and Rosie look so happy and fashionable, even on a cool, gloomy day! That last photo of you and Rosie is just heart-meltingly precious. I don’t think the black boots automatically make this outfit un-Spring-like. 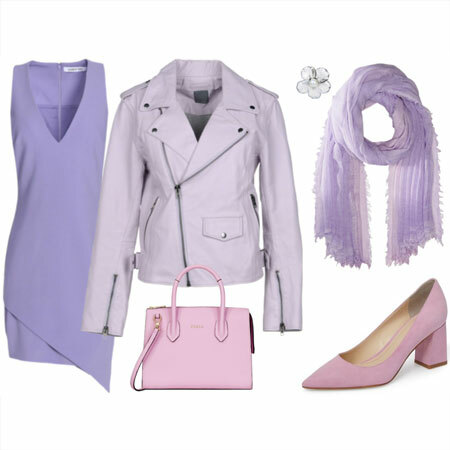 As you pointed out, the touches of color and brightness (particularly in the scarf and handbag) add some Spring cheer even as we are dealing with cold weather. You look wonderful! (And so does Rosie.) I’m in love with that green bag. If those boots show up on your Fall 2011 must-have list, I might spring for them! May I ask what lipstick you’re wearing? It’s so pretty. I have a similar outfit on today. Never thought of white pants though! It’s casual Friday, so I’m wearing blue leans tucked into knee high tall equestrian flat boots, a black and purple light top with a black blazer, hair pulled back in a ponytail. It’s probably the last time I’ll wear this outfit until the fall. It was 75 yesterday and will be 72 tomorrow and moves into the high 70s and 80s next week. The high is only 50 today though. Sweeeet outfit, Angie! I love the contrast. What a fun and creative outfit! I love the silhouette and the graphic look of the black and white combo! The way you’ve tied the scarf is perfect too. I feel like this look has a lot of authority to it, while being playful at the same time. Needless to say, Rosie is quite the adorable scene-stealer! Lovely as ever! Your apple green satchel is the perfect compliment (as well as Rosie, what a cutie). p.s.We have a sunny day in Portland, Angie, yippee! Sending warm and sunny wishes your way. It’s a good thing that the adorable Rosie didn’t make an appearance until the last photo or I’d never have even noticed your fab outfit. Your legs look miles long! I’m especially inspired by the way you are wearing your beautiful scarf. You look sleek and polished to perfection for your day. Wow. Such great color blocking all around, very crisp, and I can never resist an equestrian theme, so I’m sold. It’s a terrific look on you, Angie. I’m loving your FAB hair and the small changes you and your stylist make here and there. Your black top – is it a Halogen knit top from last year’s NAS worn backwards? There’s no way I can stop wearing boots at this point in the season. It’s nearly freezing right now outside. Oh I love that dolman top! And I’m wearing black boots today too – in Florida. But it’s cold in my office : > Your doggie is too precious, I want to smooch her. This may be one of my all-time favorites on you, Angie. It’s a sleek and fun twist on one of the most classic of classic looks. Gorgeous, and Rosie approves, too! I love this outfit. 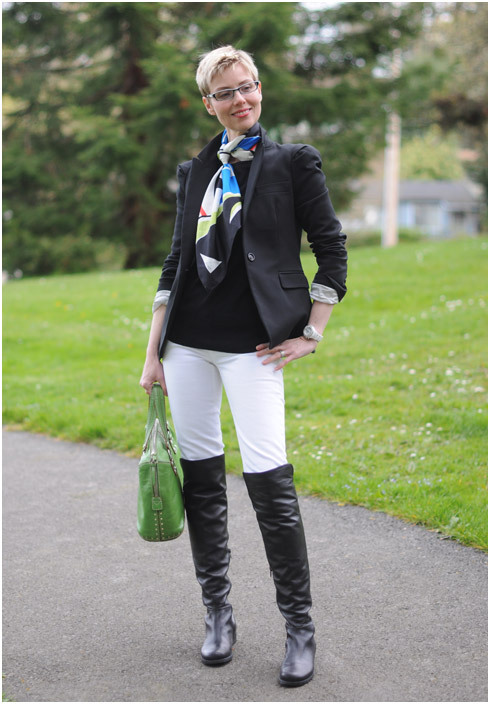 I think black boots, even OTK ones, are seasonless – they look fantastic with the white pants! And thanks for the scarf tying inspiration… I’ll have to try this knot soon. Is this a big square scarf or a long skinny one? Simply adorable, both you and Rosie. I love how you both added apple green to the mix of your black and white outfits…genius! Black and white is one of my favorite spring pairings. I’ve been looking for white jeans to tuck into tall boots for a while now. And this outfit is a perfect example of how I plan to wear them. The scarf may not be spring colors, but the silky material makes it spring for me. 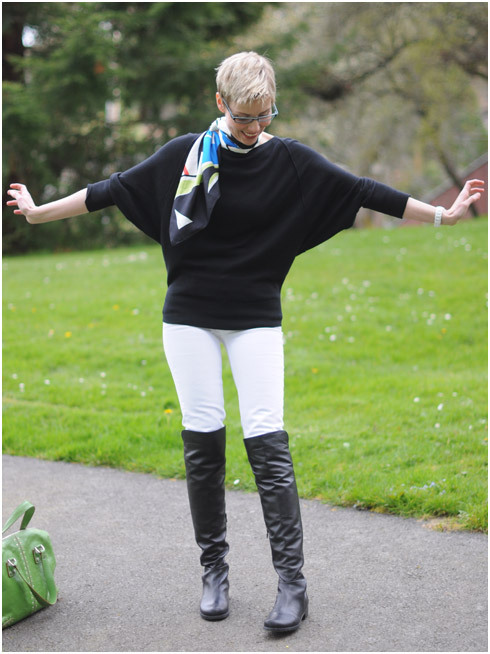 I’m not sure how else I would wear tall black boots in springtime besides with the white jeans though to keep the spring vibe. I can’t stop staring at that green handbag though. Love that color! But the star here is Rosie who is too darn cute! It snowed (flurries!) in NH yesterday, so you have my blessing on a “winter” boot outfit! I think you spring-ified it beautifully, and look smashing. Cute! I love it with the scarf and jacket!!! This is just the quintessential “Angie” outfit! You look so sleek and beautiful, and Rosie is just adorable as can be! I’m still wearing my black boots, too, even down here in So Cal! It’s been a COLD spring so far!! Yes Yes Yes. I want that whole outfit, right now. Absolutely gorgoeus. I love the sharpness of the colors including that scarf. And you look so happy in those pictures, especially that last one with Rosie. Of course! I love your green bag! While I love black and white at practically any season, it really says spring and summer to me. So crisp and clean, and the addition of a wonderful scarf makes it special. 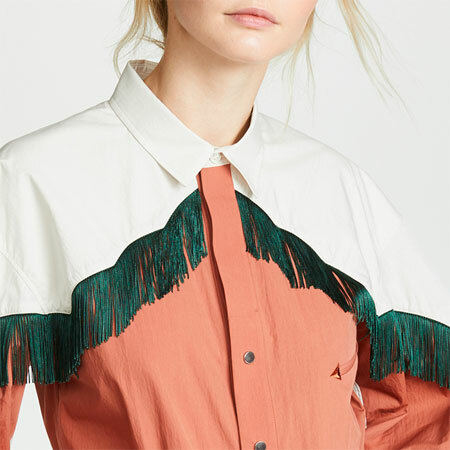 Love the whole equestrian vibe too – makes it fun and fashionable. And thanks for Rosie, love seeing her with her mom. Beth, Inge and Velma, I high five your love for equestrian styled outfits. Laura, unfortunately I do not ride horses anymore. Perhaps I will take up the sport again one day – with Greg. Lena, you are close and very observant. It’s the Hinge pullover that I popped into the YLF store last year worn pulled up so that the front neck is higher and the back neck lower. Joy and Taylor, you always say such lovely things and I always appreciate them. 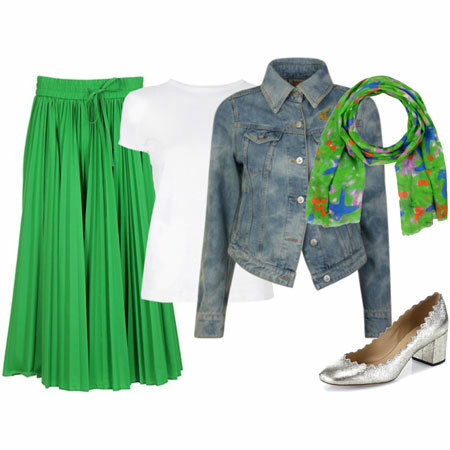 Inge and Antje, this outfit made me think of you, and I can so see you sport it in a heartbeat as you say! The scarf is a 35 inch square, so it’s bigger than it looks. I don’t find the dolman sleeve top annoying under a fitted blazer. 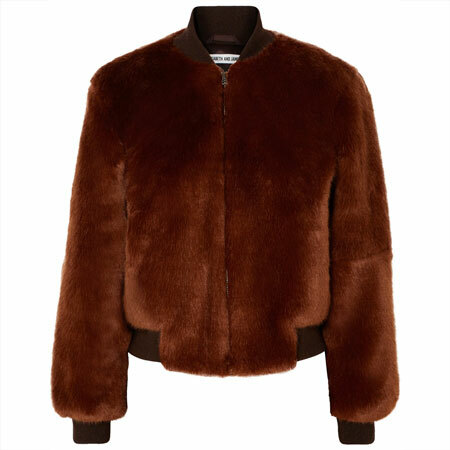 I pull up the sleeves of the pullover and the jacket and get on with it. Perhaps that’s my trick! I folded the scarf into a diagonal worm for extra length. Then I tied it like a man’s tie. I pulled the knot to the side and left one tie hanging in front of the outfit, while the other end hangs down the back. Quite simple really. Allicat, I’m wearing MAC’s “Hot Tahiti” on my lips. Jonesy, you put it well. This outfit feels authoritarian, but playful. I love this whole outfit, especially the top with the dolman sleeves. And Rosie makes me want to get a Yorkie, even though I’m more of a cat person. Thank you for the info, Angie. It is such a gorgeous scarf and it has exactly the right “vibe” for this outfit. Oh lookat da little doggie! Such a pretty girl! What boots are you wearing? At first I thought they were the Weitzman 5050 boots but I think I see a zipper on yours. Please let me know, you look amazing. You and Rosie are both adorable, and of course I love Rosie’s name! How are those dolman sleeves under your blazer? Do they bunch up? That factor usually makes me avoid “interesting” sleeves. Great transitional outfit. I am gaining courage to break out my two new pairs of white jeans, not easy when you live on a ranch, work in a restaurant, and it continues to rain. But this gives me ideas! wow, Angie, this is a fantastic combination. I love the green satchel – it’s the perfect spring grass green and works brilliantly with the black, white, and coloured scarf. Perfect. As someone who has done her fair share of stable time (DD rode for 10 years), I must say that I’ve never seen equestrian done so well! You look fabulous, Angie! Give that darling little Rosie a big hug for me. Fab as usual Angie! I especially love Rosie, the boots and the bag!!! I want some equestrian style boots. KILLER to the power of KILLER. I am such a sucker for anything black and white. You look fab. I have a lot silky big square scarves not too many long ones) that I never wear, because I really don’t know how to tie or what to wear them with. I always envy women who know what to do with a scarf. It really adds just the right amount of pop to an outfit. Fab! So fun! And I adore the extra details you’ve mentioned in the comments – those little details that I seem always to miss unless they’re pointed out, but that make all the difference and show just how much care it takes to create an outfit that seems so easy. Beautiful! I would have never thought of black boots with white clamdiggers. I’ll have to try this! So cute. And then there’s the outfit. 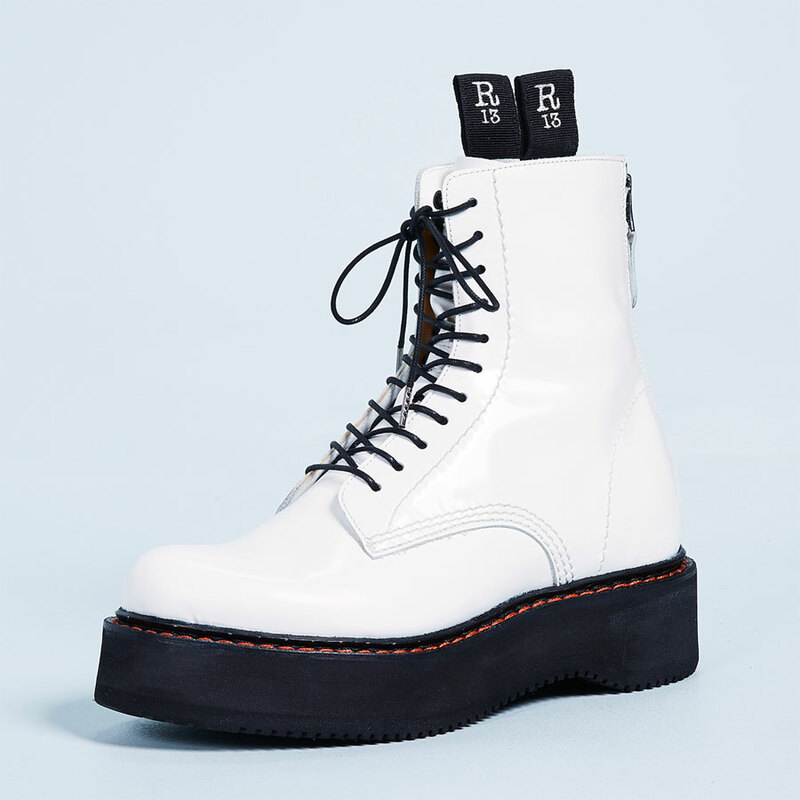 Well, I’m immediately stealing the idea for the boots with white jeans, which will be helpful since I cannot find a pair I like that is also long enough. The color combo is so fresh, but then the black grounds it beautifully. This really is perfection. Thank you so much for documenting and sharing it. I give up. Why aren’t silky scarves “seasonal”? And I’m also curious about wearing a tailored jacket over dolman sleeves. No bunching? Thank you, ladies. And my pleasure, Inge. Mamark and Melinda, I don’t find the dolman sleeve ill fitting under a fitted blazer. As I mentioned in an earlier comment I pull up the sleeves of the pullover and the jacket, which helps bunching I guess. Mary, these are Stuart Weitzman boots. But they are the Nordstrom Anniversary Sale addition, which came with a side zipper. In warmer climates, silky scarves are used year round – so this makes them a non-seasonal item. I love the equestrian style. Do you still ride horses, Angie? I adore your outfit….I used to ride dressage and LOVED wearing the clothing. I MUST learn how to wear scarves….darn it! I am such a nerd sometimes, well, maybe not a nerd but just a wee bit unsure about colors. 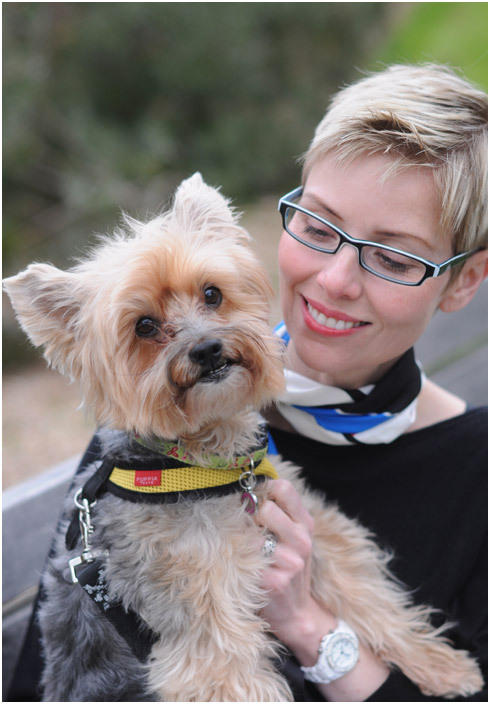 How gorgeous – and I mean you Angie in your outfit, Rosie with her matching collar, and the lovely day outside. Angie you look FAB – as usual! Beautiful outfit Angie. I love this look and always have. Great pictures that you and Greg made too. I laughed at all the spring dandelions in the one picture and swooned at the portrait of Mum and Rosie in another. This is Saturday as I write and what a gorgeous day in Seattle!! You and Rosie both look fab Angie! Love the dolman top! Beautiful. I love this outfit and the black boots with the white jeans in the spring is perfect. love this outfit, especially the scarf and dolman sleeves. the white jeans look great too, and the blazer…ok it’s all great! i would totally wear over the knee black boots in this weather. no matter what season it’s supposed to be, it’s been chilly. What a gorgeous picture of you and Rosie. I love you outfit. Anna rode dressage for about 10 year! I miss it. Your outfit is just perfection. So crisp and so clean! Love love love your style. And I am determined to hunt down the MK satchel one day. How fun it must be to carry an apple green bag! I love white pants and even though it’s still cold, the fact that you paired it with tall boots and black top and black blazer makes the outfit perfect for this weather. Great outfit for a chilly spring day. Rosie looks like she smells so sweet! What a perfectly groomed Yorkie. I love the simple strong statement this look is making and I’m going to wear my scarf that way a.s.a.p. You look fab Mrs. Cox. Hi Angie, I love it! As a fellow dressage rider, I heartily approve. I’m officially in LOVE with that top, those boots, that scarf and that watch…I’ll take one of each, please!